How did I get so far behind with the blog so fast?? 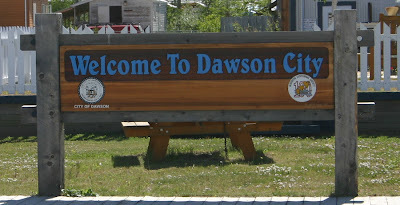 After leaving Whitehorse we drove to Dawson City. 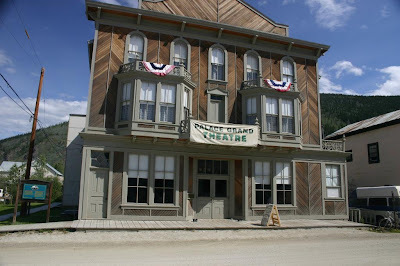 Dawson City is ground zero of the Great Klondike Gold Rush of 1898. It is a 330 mile, 7 hour drive with only to small places during the drive from Whitehorse. The bigger of the two has a few houses and a small store that sells gas. The other place is really only a lodge that sells gas. The weather was great, the road was sort of typical, mostly good, two long stretches of gravel and a couple of spots with a lot of bad potholes. The gravel stretches were better than the pothole stretches. The gravel stretches are so dusty that when a vehicle passes going the opposite direction you are completely blind for about 10 to 20 seconds. We thought we would see a lot of wildlife since the area was so remote, but didn’t see any during the drive. We are really up north and it stays light very late. Sundown is 12:52 AM and sunrise is 3:48 AM. We went to bed with the A\C running and woke to gray skies and light rain. First time we have used the A\C in 15 months! 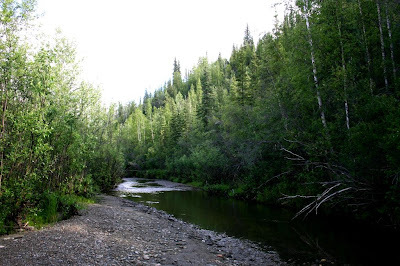 This is the actual site were George Carmack, Skookum Jim, and Tagish Charlie found the gold that started the Klondike Gold Rush. 100,000 people set out for the Klondike when news of the discovery got out. It is believed of that about 30,000 actually made it all the way to Dawson City. It took most of them a year to get there. Most arrived too late to find much gold, but others including George Carmack, Skookum Jim, and Tagish Charlie made a fortune. Conservative estimates are that more than 500 million dollars worth of gold were found during the gold rush. After the gold rush around 1910 corporate gold mining took over in the Yukon. This is Gold Dredge #4, it is the largest wooden dredge ever built in North America. It is 5 stories tall and over 200 feet long and over 40 feet wide. It could dig down 57 feet and move tons of gravel per minute. Built at a cost of $500,000 in the early 1900s and at time when gold was only $35 per once and when the mining season only last for 4 months it was making a profit before the end of its first year. At one point there were 26 dredges working the rivers around Dawson City running 24 hours per day 7 days per week. Gold Dredge #4 continued to work at a profit until it sunk in the 1960s. Dawson City is a National Historic Site. They have strict rules that any repairs or renovation can only use materials that were in use in Dawson City in the early 1900s. So, no vinyl siding, stucco, steel, etc can be used. Parks Canada also has 22 buildings from the period that they are maintaining, restoring or at least stabilizing. 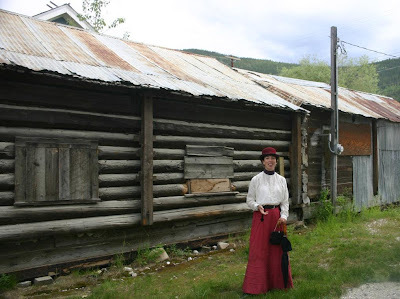 We took a docent lead city tour of many of these old buildings, while she gave us a history of Dawson City from its founding during the gold rush to the present. On 8th street in Dawson City is the cabin that writer Jack London lived in when he was here during the gold rush. The homes of poet Robert Service and Canadian writer Pierre Berton are also on 8th street. Jack London is of course most noted for his stories The Call of the Wild, White Fang and To Build a Fire. All of which take place in the Klondike. Pierre Berton authored 50 books during his life time many dealing with the history of the Klondike and the north. Robert Service is most famous for the poems The Cremation of Sam Mcgee and The Shooting of Dan Mcgrew. These are also about characters and events of the Klondike. 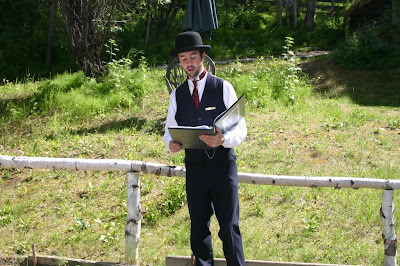 Robert Service’s cabin is a Parks Canada site and they have a docent that gives the life history of Robert Service and how he came to Dawson City. The docent also reads several of Services lesser known works. 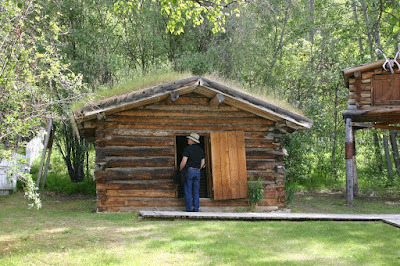 The Jack London Cabin and Interpretive Center is ½ block away from the Service cabin and contains artifacts and history of the time Jack London spent as a prospector in the Klondike. We made it to the Alaskan border late yesterday afternoon, by 5:00 Alaska time. (That's 6:00 Pacific time.) It is the most northern land border crossing in the US, at this tiny little outpost with an authentic log cabin for the US Customs Inspector! if we had any extra transmission fluid. (Huh? Is that one of those things you're not allowed to bring across the border?) It turns out the fifth wheel parked to the side of the log cabin had some serious problems and needed some transmission fluid. So Grant said, "Actually we do have some!" The inspector said, "Great, you might ask those people if they could use it, maybe they can get under way!" Off we went. Not only did this couple from Canada need transmission fluid, they broke a spring in their axle of the trailer, but he had a spare! They were very appreciative and offered to pay us. I said, "No, that's ok, we've enjoyed Canadian hospitality for 26 days now, we would be happy to just give it to you!" But to tell you about our arduous day, we have to start at the beginning. 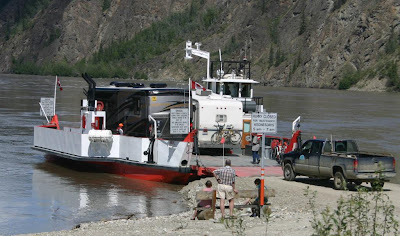 We had a 6 hour wait at the Yukon River in Dawson City. There's no bridge since this is a summer only road, so they have this small ferry that can only take 2 motor homes and a couple of cars at a time! Unknown to us, there were 26 rvs in a caravan ahead of us! We just sat in this long, slow moving line down the middle of town. It only took about 4 minutes to cross and it is free! 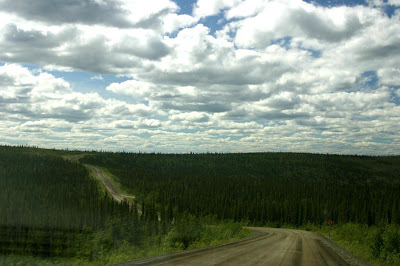 Then we had the experience of traveling on the "Top of the World Highway" from Dawson City to the Alaska border crossing, mainly gravel and dirt for 65 miles. We were doing good, better surface than some California roads! :-) There was no rain to turn the dirt into mud, but the water pumper truck loomed around one corner and hosed everything down to keep the dust down! INSTANT MUD! There are some places on the bottom of the trailer and the truck that look more like stucco had been administered!! After the border we traveled the "Taylor Highway" for 43 miles, also gravel and in less repair, lots of rocks showing through. We caught up with some of the very slow moving caravan of motorhomes, our top speed was 11 miles an hour!!! After miles of accumulating their dust, they finally found a spot to pull over and we moved on by. All of a sudden we had to find a place to pull over, because we had a gasoline tanker barreling down behind us! We found a wide spot and let him through! The first town in Alaska is "Chicken", barely a town, mainly an RV Park and cafe. It looked like the caravan was heading there so Grant decided to push on to Tok, Alaska where we had reservations. So, 2 more hours of driving, with a mostly paved road, in a lot better condition than we had been led to believe. We actually got up to 50 miles per hour! Thank goodness there's a great restaurant next to the rv park. It was 9:00 Yukon time according to our stomachs and we hadn't had dinner yet, just a few carb snacks! Our favorite brew, Alaskan Amber was on tap, ice cold and they made wonderful California hamburgers! Despite the sun still being up, all three of us fell asleep instantly and slept like logs! Thanks for the blog Kathy. We made that trip last summer and you are following our route very closely. It's really cool to watch your progress. We did the Top of the World Hwy coming back, in the rain, with a lot of other rigs. It was not a pleasant day of travel! If you think your camper is dirty, you should have seen our's!!! I think I'm still washing mud off. Our son lives in Fairbanks and we've been to Alaska several times. Just LOVE it. Wish we were up there this summer. PS AKbound was our blog.